Add impressive stitching to your projects with our new adjustable bobbin case for Bobbin Work which allows you to use a variety of decorative threads and ribbons in your creations. Use the new bobbin case to create reverse “upside down” sewing with specialty threads that don’t fit through the eye of the needle, and experience the delight when you turn the fabric over to see the raised 3D stitches you have added to your creation. The kit includes 20 free-motion design templates (.pdf data), bobbin case for Bobbin Work, specialty thread bobbin cover, small screwdriver and Instructional CD-Rom. 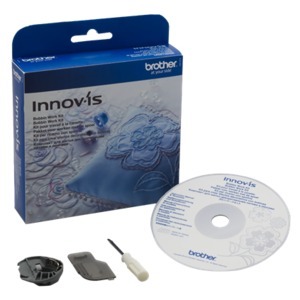 Compatible with most Brother® Innov-ís Sewing and Embroidery Machines.